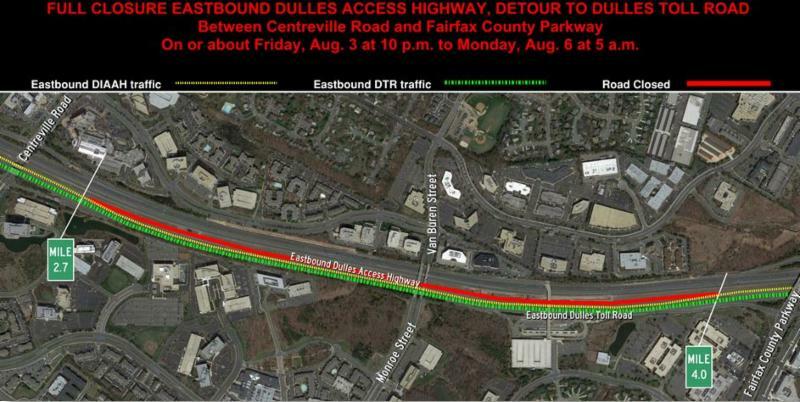 Weekend Construction Requires Full Closure of Eastbound Dulles Access Highway between Centreville Road and Fairfax County Parkway Friday, Aug.3, at 10 p.m. until Monday, Aug. 6, at 5 a.m.
Beginning on or about Friday, Aug. 3, at 10 p.m. and continuing through the weekend until Monday, Aug. 6, at 5 a.m., Dulles Corridor Metrorail Project (DCMP) crews will be performing storm drain work along the eastbound Dulles Access Highway (DIAAH), requiring the full closure of the eastbound DIAAH between Centreville Road and the Fairfax County Parkway over the weekend. Eastbound DIAAH traffic between mile markers 2.7 and 4.0 will be diverted to the left lane of the eastbound DTR. The detour will be in place through the weekend.